In what can only be called a medical oddity, doctors in Columbia found that a man’s lung tumor wasn’t actually caused by human cancer cells, but those of a parasite. Apparently, due to the patient’s weakened immune system, cells from the parasite leached into the rest of the body and eventually developed into cancer. This is the very first reported case of a patient sick with cancer sourced from outside the body. It’s literally alien cancer. The 41-year-old man from Medellín, Colombia, came into the hospital with symptoms of fatigue, fever, cough, and weight loss which had been going on for several months. The patient was infected with HIV for almost a decade and had not taken his medication. CT scans showed tumors in his lung and lymph nodes. The situation was disheartening enough as it was but the real surprise came after the biopsy results came in. Under the microscope the cancer cells multiplied quickly and crowded together. Nothing wrong about that – that’s your typical cancer. However, these cells looked like no cancer cells the doctors had seen before. These were 10 times smaller than typical human cancer cells, so the researchers contacted their colleagues from the US at the CDC for help. Genetic screening confirmed that the cells weren’t human, but foreign. These belonged to a tapeworm. The patient hadn’t been taking his HIV medication and the H. nana tapeworm could have been inside him for years. Hymenolepis nana is a species of tapeworm that infects the gut of humans, but rarely invades into other tissues. It couldn’t possibly under normal condition since the immune system would zap any foreign cells. But not only was the man’s immune system compromised after years and years of HIV, he also had an abnormally large number of tapeworms in his intestines. As the tapeworms were growing in his intestines, eventually some of the tapeworm cells acquired mutations that caused them to be cancerous. The cancerous tapeworm cells grew very quickly, like a human cancer would, and ended up leaving the intestines, although the exact migration mechanism has yet to be elucidated. 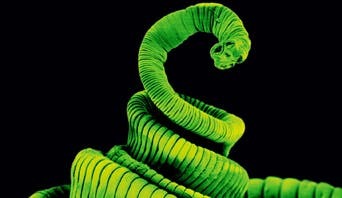 “We were amazed when we found this new type of disease — tapeworms growing inside a person, essentially getting cancer, that spreads to the person, causing tumors,” said study researcher Dr. Atis Muehlenbachs, a staff pathologist at the Centers for Disease Control and Prevention’s Infectious Diseases Pathology Branch (IDPB). This is the very first such case known to science. There has been no other report until now of cancer sourced from some other animal. However, H. nana – the most common tapeworm- affects 75 million people worldwide and HIV millions more. The patient’s case likely isn’t alone, despite no other reports are available. It’s not clear yet if treatments aimed at human cancer cells work on tapeworm cancer cells. The man died shortly after receiving his cancer diagnosis, but not because of cancer. By that time, he was in a deplorable condition. The man eventually succumbed due to renal failure. The case was documented in the New England Journal of Medicine.